Despite critical success in the USA, M T Anderson’s novels for young people have not had a similar impact in this country. This novel, a new departure for the author, has just won the United States 2006 National Book Award in the Young People’s Category. The first of a projected two volumes tracing the life of an extraordinary slave in Massachusetts at the time of the American Revolution, it is a demanding read that has few, if any, precedents in novels written for young people. It is written as a number of discovered historical documents: mainly Octavian’s own later account in the style of a memoir of a man of letters (the book is presented in antique library style and roughly cut pages), but also ungrammatical epistles home from a volunteer in the revolutionary militia and other, more ephemeral papers, like a slave catcher’s note. 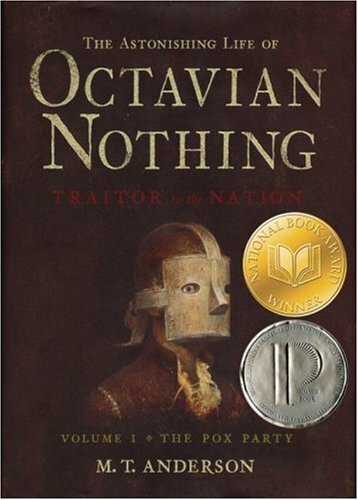 The circumstances of Octavian’s upbringing, in initial ignorance of his status, in a house of enlightenment philosophers, as an educational and social experiment, and the time of revolutionary turbulence in which he grows up, also provide the basis for a discussion of political and social ideas concerning race, freedom, and the nature of identity and society. If this sounds daunting (and it will be to many young readers), both form and themes are integral to a fascinating, disturbing, and sometimes funny, drama whose twists and turns steadily tighten its grip, as Octavian moves from a privileged, sequestered and vaguely troubled childhood into a desperate and brutal adolescence on the run. This is an outstanding historical novel, which creates the illusion of a tangible past where the highest ideals can be accompanied by the foulest cruelty, where reason is pursued to the point of absurdity, where one man’s freedom is at the price of another’s slavery; and, given all that, there is still the possibility of making the world anew.